A beautiful tallit featuring a shimmering watercolor ocean and a setting sun. 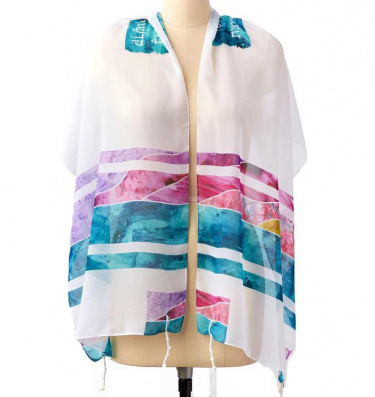 This tallit is printed onto 100% poly chiffon, a super soft and lightweight fabric that you'll love to drape around your shoulders. Perfect for anyone having a Bar Mitzvah or Bat Mitzvah and adults.